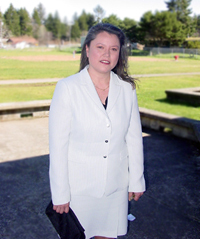 Fawn R. Sharp is the current President of the Quinault Indian Nation in Taholah, Washington. Her past positions included managing attorney and lead counsel; and staff attorney for the Quinault Indian Nation, administrative law judge for the Washington state Department of Revenue – Tax Appeals Division, Quinault Tribal Court Associate Judge, and Counsel for Phillips, Krause & Brown. Ms. Sharp has held numerous leadership positions, including an appointment by Governor Gary Locke to serve as Trustee for Grays Harbor College, Governor of the Washington State Bar Association, Trustee of Washington State Bar Association – Indian Law Section, Vice President and Founding Member for the National Intertribal Tax Alliance, and Director/Secretary of the Quinault Nation Enterprises Board. Fawn has conducted lectures and publications all over the United States. Ms. Sharp graduated with a Bachelor of Arts from Gonzaga University in Spokane Washington at the age of 19. She received her Juris Doctorate from the University of Washington in 1995 and has subsequently received certificates from the National Judicial College at the University of Nevada, and from the International Human Rights Law at Oxford University. Ms. Sharp resides with her husband, Dan Malvini, and their son, Daniel Malvini II. Got a Suggestion, idea or concern? Umatilla-- The Quinault Indian Nation hosted a reception for Canoe Journeys 2013 at the Tamastslisk Cultural Institute on the Umatilla Reservation on September 25, 2012. Tribal leaders and others attended to give their support and encouragement to the Quinaults for hosting Canoe Journeys 2013. Among the speakers were Billy Frank, Jr, who spoke about Quinault Elder Emmet Oliver's vision for canoe journeys many years ago. Mel Sheldon, Tulalip Tribal Chair; Frances Charles, Lower Elwha Klallam Chair; Brian Cladoosby, Swinomish Tribal Chair and Charlene Krise of the Squaxin Island Tribal Council also participated and had many words of encouragement for the Quinaults. The journey has taken place every year since The Paddle to Seattle in Washington State's centennial year of 1989. It has consistently expanded and helped educate people near and far about the significance of tribal traditional values. 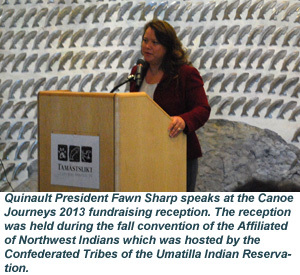 Quinault President Fawn Sharp speaks at the Canoe Journey 2013 fundraising reception. The reception was held during the fall convention of the Affiliated Tribes of Northwest Indians which was hosted by the Confederated Tribes of the Umatilla Indian Reservation. 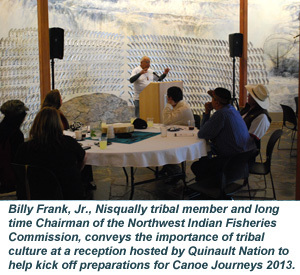 Brian Cladoosby, Chairman of the Swinomish Tribe, was one of several tribal dignitaries who pledged to support Quinault Nation in making Canoe Journeys 2013 a great success. Umatilla-Quinault President Fawn Sharp was honored by Council Members of the Confederated Tribes of Umatilla Indian Reservation (CTUIR) during the 59th Annual Affiliated Tribes of Northwest Indians (ATNI) fall convention held at Umatilla's Wildhorse Casino and Resort in Pendleton, OR September 22 - 27. 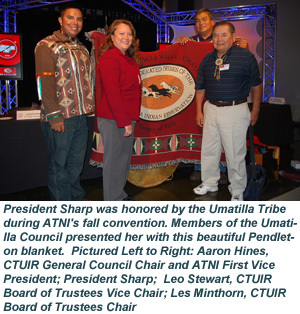 Sharp, who is also President of ATNI, was honored as the first woman president of that organization, which represents 57 tribes in seven Northwest states, and for "surviving her first year in office." "I am proud to serve as the president of Affiliated Tribes, and represent the people of Quinault as well as other tribes in that capacity," said Sharp. "ATNI is a powerful voice for bringing issues forward that affect all tribes in the Northwest, and many of those concerns go on to become nationwide proposals. ATNI gives Northwest tribes the ability to shape federal policy in our areas of common concern. By doing so, Northwest tribes continue to honor the legacy of past leaders who made defining and strengthening tribal sovereignty their life's work," she said. The Umatilla Tribe presented President Sharp a Pendleton blanket adorned with the CTUIR emblem.